We're 33 weeks now, and I'm way behind on blogging. I still want to share the rest of my photos from my Illinois visit, my Colorado baby shower, and several other things, but I still need to load all the photos and look through them. In the meantime, I have so many things to share from the past couple of weeks that I'll have to split it all up into several different posts. 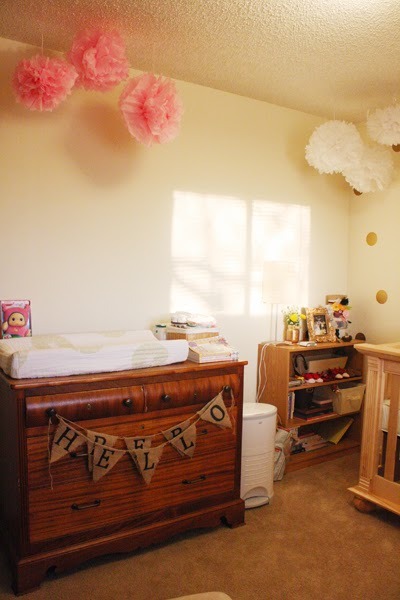 For now, here's a peek at Baby Wilson's nursery! Last weekend Nick and I came close to finishing it. We're so happy with the way it turned out, and we have just a have a few finishing touches to add. 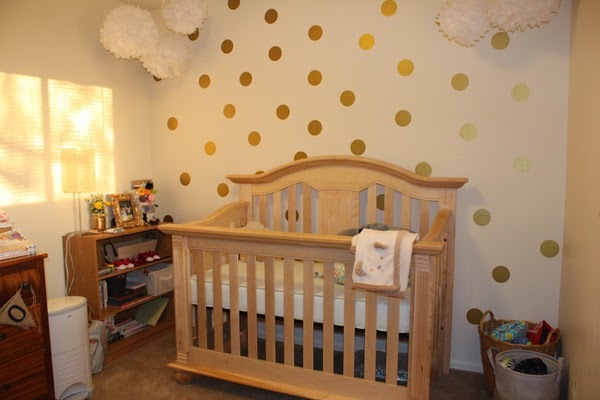 We absolutely love the matte gold glitter polka dot wall decals (found on Etsy)! 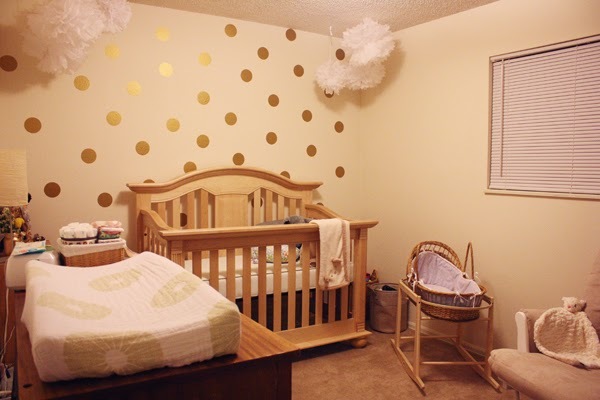 Our goal was to make the nursery feminine and chic, but without an overwhelming amount of pink. We still have to hang the curtains, and we'll add a framed piece of art on that blank corner wall. The bassinet is very special to me. My grandmother gave it to my mother at her baby shower when she was pregnant with me. I slept in it as a baby, my brother slept in it, and my brother's kids slept in it. Now my little girl will sleep in it! We're waiting until we meet our little angel before we name her. Once she has a name, we'll get wooden letters and spell her name on the wall above the dresser/changing station. We'll also be hanging the "Hello Bebe" banner (currently on the dresser) somewhere in the room, probably above the crib. I plan to hang one or two small bookshelves on the wall above the small corner bookshelf. The antique dresser was in my room growing up. The crib is solid maple, so it's a very hard wood. It's a convertible crib, so it will turn into a toddler bed and then a full-size bed. We wanted a solid hard wood so the furniture will last through her teenage years. We also got our car seat and stroller, which was the last major piece of baby gear we needed before we're ready for her arrival. She's got a few more weeks to finish baking, but we can't wait to meet our little bun!